The world of Toy Story is so well imagined and detailed, it feels there is always room for another instalment. Hilarious, emotional and philosophical; Woody, Buzz and the rest of the Andy’s room crew have repeatedly shown us the rich and unique potential of computer animated films. I wish I could bring you a further sneak peek of Toy Story 4. After all – unlike many franchises – every new story is almost perfect in its own right. However, we are going to have to hold out until 2019 to catch up with out favourite toys, in a story where ‘Woody and Buzz go on an adventure to find the one toy who was given away… Bo Peep’ according to IMDb. In the meantime, you can now have adventures of your own at a brand new themed Toy Story Land at Walt Disney World, arriving just in time for summer 2018. This is your chance to discover what it’s like to be a toy with all-new attractions, quick-and-easy dining options… and so much more. Amid a colorful landscape filled with giant building blocks and game board pieces, you’ll be immersed in an experience straight out of Andy’s vivid imagination — together with Woody, Buzz, Slinky Dog, Rex, the Aliens and many other beloved Toy Story Characters. This new land will be based at Hollywood Studios – as well at Shanghai Disney – and will apparently help the theme park become a place where visitors can truly become immersed in their favourite stories. According to Insider, the location announcement was made on Saturday afternoon by Walt Disney World parks and resorts chairman Bob Chapek at D23 Expo to 7,000 excited fans. Not much else is known about the park, although there is reportedly two main attractions, and one ‘fan favourite’. Andy’s assembled his awesome coaster kit… and Slinky Dog is ready to take you for a wild ride on a crazy coaster—one that gives you a glimpse of all that Toy Story Land has to offer. 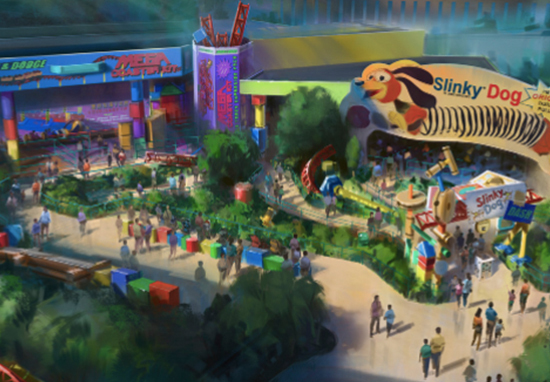 Come along as Slinky Dog bends and twists his coils around curves, hills, bridges and drops. Hang on tight as your toy rocket ride takes off, all while space electronica provides an out-of-this-world beat. Head inside and slip under Andy’s bed where the toys have set up their carnival playset. Then, blast your way through targets, using everything from baseballs to cream pies. With such an action packed series of films, there is great potential for some truly thrilling and unforgettable attractions.